Strokkur (Icelandic for "churn") is a geyser in the geothermic region beside the Hvítá River in Iceland in the southwest part of the country, east of Reykjavik. It is one of Iceland's most famous geysirs, erupting regularly every 4-8 minutes generally. The small geothermal area in which the geyser lies is one of the major tourist attractions in iceland. Strokkur was first reported in 1789, after an earthquake which probably created or unblocked its conduit. 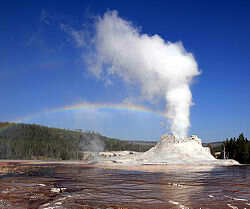 Eruptions were regular until 1896, after which a renewed earthquake inactivated the geyser. In 1963, local people succeeded in unblocking the plumbing system and Strokkur has been active ever since. First records of geyser activity in the area date back to 1294, when the great Geysir is thought to have become active. 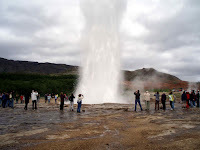 Strokkur and its surrounding areas, as mentioned is famous throughout Iceland and regularly attracts tourists to view the geyser, as it is one of very few natural geysers to erupt frequently and reliably. Water at a depth of 23 metres is around 120°C, but cannot boil because of the weight of the water pushing down on it from above. When this water is forced up to around 16 metres, some of the water may be above boiling point, and this sets off the chain reaction we see. The pressure decrease allows more water to boil and flash boil into steam, which drives the unboiled water further up the conduit. As this happens closer and closer to the surface, with increasing velocity, the water and steam is forced out, and it is this mixture of water & steam that forms the eruption. 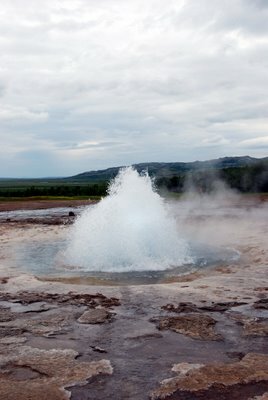 How does a geyser work? Basically, a geyser requires a heat source (cooling magma), a source of water, permeable rocks through superheated waters can rise and a pressure-tight (i.e. non-permeable) chamber or series of chambers where pressure can build up prior to eruption. Most geysers are found in highly silicic rhyolitic rocks. Superheated waters dissolve silica from these rocks at temperatures of around 300'C which exist in the high-pressure environment deep under the surface. Silica exsolves again and is deposited when the superheated waters boil or cool as pressure and temperature fall, respectively as they rise towards the surface. The deposited "geyserite" (largely hydrated silicon dioxide (a form of opal)) seals the geysers plumbing system, allowing it to pressurize. Travertine formation is fostered by carbon dioxide gases rises from below which dissolve calcium out of the underlying rocks forming calcium carbonate. This is transported to the surface dissolved in the geothermal waters and is deposited there once the waters evaporate. 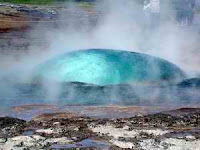 In an active geyser system, superheated waters rise into the geysers chamber(s), whilst cooler near-surface waters (may) also enter the chamber from above. These initially effectively cap the hotter water body below keeping it pressurized and allowing it to maintain temperatures well above boiling point under atmospheric pressure conditions. As the chamber fills, the superheated water body transfers heat to the cooler water above. Eventually, the upper water body reaches boiling point. As heating continues water vapour (gas) formation becomes more vigorous and water may start to be pushed out of the vent (at Strokkur this is seen as a rising and falling of the pool). Eventually, the overflow and / or increasing concentration of bubbles decreases the mass of the upper water body, thus reducing the pressure acting on the body of superheated water below. This depressurization causes violent "run-away" vaporization of the water below, resulting in water and steam being violently expelled upwards, causing the eruption. 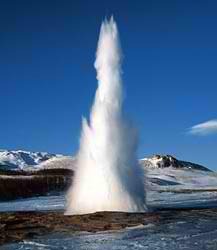 Eruptions at Strokkur are very short, each involving a single or series of discrete thrusts. In the geothermal system feeding Strokkur, subsurface temperatures of about 240'C are thought to exist, probably at a depth of 1 km and below. Don´t let the scientific explanations spoil your sense of wonder and magic. One final comment or request - The silica sinter is delicate and althoug constantly being formed it takes years - reminding us to respect the beauty of this unique area and leave the nature to evolve on its own. A good photograph is a much better souvenir than a piece of sinter.